I hope you all have a fabulous weekend. We are celebrating Fastnacht (Carnival) here in Germany and although I don't get too involved myself I've greatly enjoyed organising costumes for my boys. Tomorrow we will all go to a street parade and they will wear their little lamb outfits. I have been greatly enjoying Holly Becker's Blogging Your Way course and today I worked on a little assignment we were given. She asked everyone to create a mood board that represents the look and feel of our blog. Initially I found it a little difficult cutting into my interior magazines but I think it was worth it in the end. I had great fun. This is what I came up with. 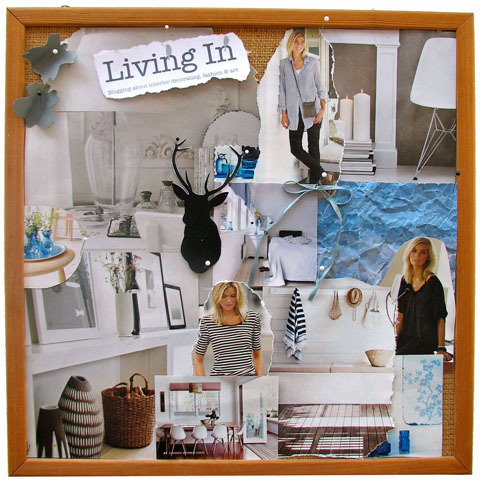 Your mood board looks lovely! I like the addition of the deer in silhouette. Very nice, Nina! I connect with all these images, and especially with the eames chairs and the deer.